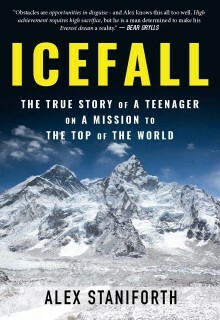 Like most Everest books, it’s concerned with the central character’s story, and this is really what makes Icefall shine. Alex Staniforth faced significant adversity in his teenage years: depression, epileptic seizures, panic attacks, obsessive-compulsive behaviour, severe anxiety, and a confidence-destroying stutter. His fitness was poor and he lacked the drive or determination to do anything. But at some point, everything changed and he started to take an interest in wildlife and caring for the environment, which led to hillwalking and eventually mountaineering. After his first trip to the Lake District, he decided he wanted to climb Everest. I know what you’re thinking – a teenager visits the Lake District and, with very little experience, decides he wants to climb the highest mountain on Earth. This must happen all the time, but the difference here is that this is no passing obsession. He commits to this goal completely. He channels all of his energy and resources into this one objective, using it as a focal point to overcome the challenges arrayed against him. And this is the soul of the book. 99% of people could not possibly do what Alex Staniforth has done. 99% of people would give up when attempting to solo the Three Peaks Challenge at the age of sixteen, or after suffering the first training injury, or when it became too tempting to slacken the pace and focus on school and fun for a while. The struggle is relentless. Focusing on his goal helps him to control his depression and anxiety, and the training improves his fitness, but seeking sponsorship forces him to do something he dreads: public speaking. Despite his stammer, he finds that this is something he’s good at as well. After telling the story of how Alex built up his mountaineering experience, _Icefall_ covers not one but two Everest expeditions. The first, in 2014, ends unceremoniously when the mountain is closed after a serious clash between Sherpas and Western climbers. This is a major setback for Alex, but to his credit his vision doesn’t waver, and he begins the laborious process of seeking sponsorship for a second time. He’d burned his bridges by this point, rejecting all of his university offers while on the expedition, which I think is the moment he commits to this adventure not just for a few years but for life. The story of the second expedition is the crux of the book in more ways than one. Without giving too much away, it’s a disaster of truly epic scale (another word that has become overused, but once again it’s the right word here). The author learns more about himself, and about how to cope in extreme situations, than he ever expected. He returns with a new resolve to help the people of Nepal rebuild their lives after the devastating earthquake of 2015, and his mission to inspire young people to achieve whatever they want to achieve continues with the greatest of enthusiasm. It’s refreshing to find an Everest book that’s about more than just the mountain and the summit. For Alex Staniforth, Everest becomes a metaphor for adventure in his own life. He does not set out to conquer a summit, but to overcome the challenges standing between him and success on his own terms – and he comes across as humble and generous as well as driven. This is a fine read (and well edited, I may add!) by someone who has already achieved much in a very short space of time, but there’s a definite sense that he has only just started telling his story.